By 2050 Earth’s population will reach 9 billion, according to United Nations estimates. The figure is currently 7 billion, and food security is already an issue. “We’re barely feeding the population we have now,” said UCSB professor of computer science Chandra Krintz. More food is needed, but as the human population grows and more land is used for biofuel production, less space is available to grow food crops without depleting critical water supplies or clearing forests, which produce our oxygen and provide a vast array of other ecosystem services. Climate change further complicates the scenario. Krintz and her collaborator, UCSB professor of computer science Rich Wolski, believe that big data and cloud computing can play a significant role in addressing the food challenge ahead. To that end, in a collaboration involving UCSB, other California universities, technology entrepreneurs, and farmers, they are developing SmartFarm, an open-source software platform enabled by big data and cloud computing to provide farmers with data and analytical tools to help them become more efficient, more productive, and more sustainable. Some farmers already pay agribusiness entities like Monsanto to provide them with data that is collected by field sensors, sent to the web, integrated into software, and presented visually to provide a real-time view of the state of their fields. But the cost of that service is prohibitive to millions of small farmers, and especially those in developing counties. That’s why Krintz and Wolski are designing SmartFarm as an inexpensive open-source system available to anyone. 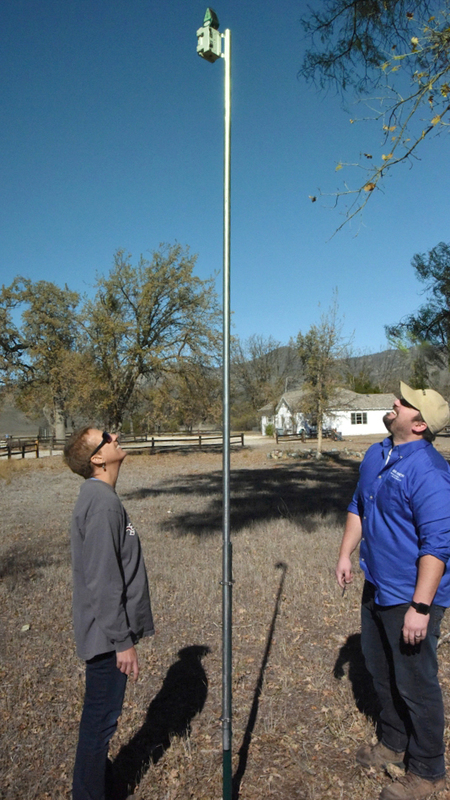 Field Intelligence: Chandra Krintz (right) and Jacob Morent of Iroometer, a partner of Smart Farm that makes soil-moisture sensors, check out a newly installed device at the UCSB Sedwick Reserve test site. Krintz specializes in cloud computing, resource-constrained devices (such as cell phones and other items that rely on battery power) and distributed systems (i.e. linked computers). She spent a year creating a mirror image of Google’s cloud that was simple enough so that ordinary users could take advantage of the versatility and economies of scale that cloud computing offers without facing such a steep learning curve. Meanwhile, by studying the architecture of the Amazon.com cloud, Wolski, an expert in large-scale high-performance computing and distributed systems, realized just how powerful the consumer-oriented software technology is in terms of linking customers and sellers around the world, predicting what consumers might want, and supporting their decision making. Wolski and Krintz joined forces at UCSB to create a similarly robust data-driven approach to support farmers around the world. Farming operations occupy nearly half of all the land on Earth. But for a variety of reasons — tradition and varying levels of access to science and technology among them — farming practices are often based on “tried-and-true” methods and educated guesswork, rather than science. SmartFarm is intended to build on and supplement existing expertise by using real-time data to support farmers’ decisions. “Instead of having all the information in their heads, as they do today, it will all be in the computer. They can easily look at a number of different options that might be harder for a single person or even a group of people to identify,” Krintz explained. To see how it would work, imagine you are a farmer during a drought. With water scarcity impacting your ability to produce as you would normally, you might consider bringing in water from a well, an aquifer, or an aqueduct. But that uses energy and costs money. Should you do it or invest instead in another, less-water-intensive crop? Or could there be a way to reduce water consumption without risking your yield? Big data can inform that decision-making landscape. Or, say your main crop isn’t doing well. Could it be the soil? The micro-climate? Sneaky pests? With sensors to monitor moisture levels, water and nutrient movement, soil conditions and composition, plus mini-weather stations to document temperature and humidity, and imaging technology to detect leaks and other anomalous conditions, you could get answers. Data taken from these devices would be crunched in the cloud (which SmartFarm uniquely makes possible on or off the farm) and then appear via applications on smartphones or tablets as visualizations that would make the results easy to understand. “Cloud computing has dramatically expanded our ability to make predictions about very small things,” Wolski said. “We want to take data and use it to make specific, localized predictions that enable more-productive and environmentally sensitive agriculture.” Just as Google and Amazon can identify an individual customer’s tastes and preferences, he said, SmartFarm could analyze data and predict on an almost per-plant basis what the grower might be able to do to maximize yield and minimize error and associated cost. “We want to use the same infrastructure, the same technology, the same mathematics and statistics, and the same cloud-computing software that’s being used to follow you around and figure out what you want for lunch, but we will use it to follow farmers around and figure out when they should water, and when and where they should apply fertilizer and pesticide and how much,” he said. The SmartFarm prototype is currently being tested on several farms, while the collaborators develop the sensor technology and software that will be the backbone of the project. One goal is, within five years, to have sensors that cost so little that they will be thought of as nearly disposable. The researchers see massive potential for this kind of data gathering and processing to benefit other fields. “We want to see the various ancillary sciences move forward,” Wolski said. In 2015 the California Energy Commission and the National Science Foundation both awarded research grants to the SmartFarm project. The NSF grant, in particular, is unusual, Krintz, said, because the US Department of Agriculture is the body that typically awards agriculture-related research, but the enormous tech component was enough to convince the NSF to take up the cause. “We’re experts in computer science and engineering at UCSB, and we’re taking perspectives on some of these problems that we may not have taken if we were enveloped by a traditional agricultural school,” she said. While the emphasis of this project will remain highly focused on the optimization of farming, agriculture, and food production, the rest of the complex food supply chain offers abundant possibilities for similar approaches. Better monitoring of farm animals’ and of food in transit could drastically reduce disease, spoilage during shipping, and outbreaks of microbe-related illness that can result — all important elements in reducing the roughly one-third of food produced globally that is lost or wasted. The researchers also plan to expand the project by involving more participants and attracting more students and researchers who have wide-ranging skillsets from other fields. The community is important, said Krintz, not just for the research but also to take a modern, technologyy-based approach to hunger, one of humanity’s oldest and most difficult problems. a number of SmartFarm components.